Welcome to Pirate Adventures, a place where children come to experience the magic of sailing away in search of sunken treasure. Come aboard our pirate ship and get caught up in this real life adventure! Be amazed as our crew taps into the wonder of a child's imagination. Your child will be painted with a curly mustache or with an anchor tattoo, dressed with a lucky treasure hunting vest and marched off to the ship. 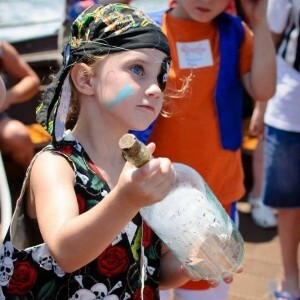 Once aboard, the young pirates will learn the rules at sea aboard the Sea Gypsy and use a treasure map to find the sunken treasure. As the crew searches for clues, they discover that Pirate Pete, the smelliest, most rotten, pirate on the Seven Seas, is lurking nearby, and he has something our brave crew needs. Off we go into battle with our famous water cannons! Will the crew defeat Pirate Pete and find the sunken treasure...? Aboard the Sea Gypsy we always find the treasure, we always defeat Pirate Pete, and the children always walk away with incredible stories! Pirate Adventures is conveniently located along the MarshWalk at the Crazy Sister Marina in the historic town of Murrells Inlet. Our great program, our caring, high energy staff and our commitment to your child's satisfaction make Pirate Adventures an outstanding choice for families on vacation or spending the day together.